When her dating app decides she’s a man, what’s a lonely lesbian to do? Jamie Richards is a scientist who embraces reason– except when it comes to romance. Tired of her impulsive streak leaving her heartbroken, she’s determined to do everything right the next time she’s in love. But her resolve crumbles when a technical glitch matches her with perfection in Claire, a woman who lives on the opposite side of the country. Who is straight. And under the impression that Jamie’s a guy. But Jamie can’t help being smitten. Would one tiny lie be so terrible if it gets her closer to the woman of her dreams? Claire Flores is a dreamer and a believer in signs, but she has a secret that keeps her cautious about love. All she wants is a picture-perfect family of her own, but she’s never met a man who attracts her. Until now. Throwing caution to the wind, she goes from Portland to Boston to meet Jay, her online love. Instead she meets Jamie, his work colleague, who befriends her in Jay’s unexpected absence. Claire’s heart is aflutter. Jamie stirs up feelings Claire never knew possible, but how close can she get without having to admit that she’s been lying to herself about her dreams all along? What starts as a simple fib soon snowballs as Jamie fabricates increasingly ridiculous tales to keep her identity as Jay under wraps, until a comedy of errors threatens to topple the whole charade to the ground. Can true love prevail when it’s founded on a lie? When trying internet dating Jamie and Claire get to know each other. The only problem is that Claire thinks Jamie is a man and lives nearby. A computer glitch caused the misunderstanding but Jamie is so smitten that she doesn’t correct the mistake. The story revolves around Jamie keeping up the pretence and Claire slowly falling in love with her. I really liked both characters and wanted it all to work out for them. Jamie didn’t keep up the’lie’ about the non-existent boyfriend, Jay, out of malice, but because once she got to know Claire she was in love and didn’t want to lose her. Claire was in denial about being a lesbian but as she became closer to Jamie she couldn’t help but fall for her. They were so right for each other. But the path of true love didn’t run smoothly. This was a really happy, funny, joyful read and I couldn’t stop reading. I love how the story unravelled and the settings also captivated me – Boston was magical and old Norwich sounded wonderful. Thoroughly recommended. This is a story that I probably wouldn’t have picked up on my own. I’m not one for reading that story about the lies people enmesh themselves with, compounding their initial mistake with lie after lie until the whole thing topples down around them in the inevitable crash that it was all headed for from the beginning little lie. I myself am rather painfully honest, so sometimes reading about people getting themselves into these situations agitates me, especially when I really like the character. It’s almost like you want to smack them upside the face and yell at them to rip the bandaid off quickly. So I probably wouldn’t have picked this book up on my own. And I would have missed out on a very entertaining read. Yes, there is that sense of inevitability to the direction of the story, because Jamie “Jay” Lee passes on several chances to ‘fess up. And you can see the betrayal getting bigger and bigger, because Jamie is using insider knowledge to get closer to Claire. The whole thing about this glitch with the dating chat site that Jay and Claire have both subscribed to is that it seems to bring fate into it. Even though I’m not sure that was a theme of the book itself. Because Claire seems to be lying to herself about her own sexuality, and the computer glitch is the only thing that allowed the two to actually connect in the first place. Claire seems extremely impetuous and not really very sensible. And both are hopeless romantics. So by the time we get to the big reveal, we’re actually rooting for the two of them, and wanting to smack Claire upside the head instead of Jamie. I have to give MacLeod kudos for the scope of the spiraling events that lead to Jay finally revealing herself to Claire. I was in awe, and that series of events made the whole inevitability of the plotline worth reading through in and of itself. In the end, it seems like Claire’s “signs” help bring about a resolution that strikes me as really sweet, and again, kind of fated. Which is extremely romantic. I would definitely recommend this book to anyone looking for an enjoyable story with likeable characters. And I’ll be looking for this author’s name in the future. This book is well written and the author obviously a very competent writer. However I found the content full of lesbian stereotypical assumptions, even if they were written in an updated context. I also found the basis of the plot, personally, a little distasteful. I felt from the outset that the outcome was very predictable and there were far to many coincidences to be genuine or real. For me there was not enough humour to make the plot acceptable and not serious enough to make it believable. This was a book that was easy to read and would fill in a few hours of your time in a likeable enough manner. Personally I would have preferred much more substance and reality. I do my best to not go into books from authors I’ve never read before with expectations. I managed to build some up after reading the synopsis for this book and I’m very happy to say that it was everything I expected it to be and more! The plot was an attention grabber and the hilarious situations the MC managed to get herself into with her love interest made me chuckle and shake my head. The entire story flowed well, had a nice arc to it and kept you interested, never knowing what was going to happen next. The characters were, I felt, well planned and just as well written and they interacted beautifully, nothing coming across as overly ‘fairy tale’ with ups and downs, twists and turns. There were moments I was laughing so hard I scared the dog and others when I was on the verge of tears hoping things would work out. If you’re looking for a book that will keep you wondering ‘Will they or won’t they?’ this is definitely one to consider! Miranda lives in New England and writes heartfelt romances featuring witty and charmingly flawed women that you’ll want to marry. Or just grab a coffee with, if that’s more your thing. 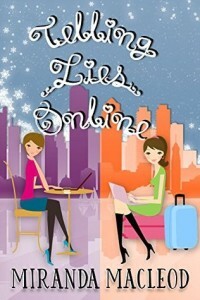 Her first novel, ‘Telling Lies Online’, is the story of Jamie and Claire, and a very big online dating mix-up. It features a cowboy hat, unusually strong sangria, and penguins. Her upcoming novel, ‘A Road through Mountains’, tells the story of Cecily and Rorie, two star-crossed lovers who reunite backstage at a production of A Streetcar Named Desire. It features second chances, a reality television diva, evil suburban soccer moms, and at least one person screaming ‘Stella’. Look for it in Spring 2016!